This tab is for the solo in Smoke on the Water by Deep Purple. The solo is the short version from the radio cut. As you probably know, "Deep Purple" was a British rock band in the 1970's. This song was released on their 1972 "Machine Head" album. The song tells a true story. In 1971, the band had set up a mobile recording studio in Montreux, Switzerland. The night before they were to record, a Frank Zappa and The Mothers of Invention concert was held in the casino. Someone shot pointed a flare gun at the ceiling and the rest is history! The resulting song is reported to be the most played rock and roll song ever. 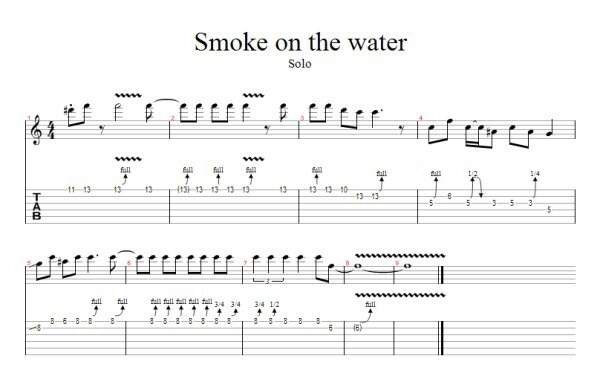 Leave "Smoke on the Water" and Go To "Free Guitar Licks"